The final session of media140 looked at building an online identity. Ask yourself who you are and how you are going to be seen, and want to be seen. Have a good attitude, it is not only what we do ourselves it is what we say and what everyone else says about us. You can control what you say, you can’t control what other people say, so you have to take that into account. Should be transparent, need to be unique, you can adapt your own identity. Be conscious about what you use it for, you have to remember it will still be there tomorrow. We make mistakes and we learn from them on the net. If you see someone else make a mistake on the net you should learn from that too. Main attitudes– transparency, common sense, share your knowledge, be humble, be constant/current, be updated. If you have a specialism – use it to find your own community. Use lists on Twitter to find and follow sources. Broadcast journalists – use online platforms to offer extensions to short broadcasted news snippets, add depth. But there were a couple of points of disagreement, too, such as audience statistics. While some encouraged the use of analytics and audience statistics, others felt a better representation of audience feedback is in the comments left behind and the focus should be on quality of content, rather than quantity to increase statistics. If you have anymore to add please do so using the comments below. This entry was posted in Events, Online Journalism, Social media and blogging and tagged Gemma Urgell, Media140, online identity, Ricard Espelt on April 14, 2011 by Rachel Bartlett. Throughout media140 so far, when it has come to a discussion of business models for journalism, most speakers seem to be in agreement that there is no single solution, rather the path is multi-directional and a mix is best. Yesterday Pat Kane discussed the main two pathways which appear to be being taken at the moment, the open web versus the paid content model, but he said a mixed model may be best. Similarly Jay Rosen, when asked by Kane at the end of the professor’s keynote later in the day about revenues, also said there is no one single model. At today’s first session, Ismael Nafria, director of digital contents at La Vanguardia, spoke along the same lines, although also indicated a commitment to a foundation of advertising in the press. He said 90 per cent of income comes from advertising. Despite this difficult situation, there is a business model for information, it is one that has existed for many decades now and is still possible. Working in online information, after having tried and experimented on many occasions for me it is quite clear what the business model should be … in general terms information depends on advertising. You have to have media open as possible reaching out to the widest audience as possible … we cannot all hope for the same rating, there are different battlefields, so to speak, so in your own niche you need to aspire to reach the highest-quality product so advertisers will invest. On top of that – as advertising is the foundation upon which we should all organise our models – we need additional elements, such as payment or subscription. This is not the solution, at least by itself, it is an additional element, revenue source, but we need to complement it with others. He added for this to work, publishers need to fully understand the internet as a medium, and how it differs from other existing mediums. There are all types of consequences of how you create information, how you reach out to audiences, what are the professional profiles that you need to offer that message to your audience. If you don’t understand that many users come through browsers, so it is very important for browsers to find you, if you don’t understand the internet is a multimedia environment, so your content should not only be textual but have multimedia and interactive elements, this information fits better in the internet environment. It’s the only way to have a competent product. As long as you are able to offer your internet product in the way that the internet demands it, it’s not a problem. In order to achieve this content and commercial teams should be working “hand in hand” he added. “They are part of the very business we’re working for. It’s not always the case and it’s not always easy. Whoever is neglecting it is making a big mistake,” he said. I don’t believe that our job is coming to an end, its the opposite. The more info available in the world the more necessary are these figures that can help us as citizens to process and digest all that information. Similarly fellow speaker Carles Capdevila, who is director of daily title ARA, which offers a premium part of its content via a sign-up, while the rest of its content remains open online, said the title is in the process of looking for a multi-platform business model. We are learning by doing, we created a business, we are trying to look for the right model and we’re doing that live, everyday. We know the traditional press model is dying off and other models are popping up and we’re committed to choice. We aim for it to be sustainable, looking for different models at the same time. He also went on to talk about the value of social media in the development of ARA’s business model and popularity. “We were created through the social media”, he said. We explained every day who we were and what we wanted to do. We began operating with a constant dialogue with users. We’re so flexible as to modify what in the past was known as a market study, we have one every day … We are a newspaper that was created together with its users through social media, but it also goes through the newsagents, offers a supplement … I declare myself to be agnostic, or multi-agnostic to platforms. I don’t let myself get carried away by anyone. We don’t believe in paper we just practice it. We practice our paper religion but its a temporary faith. We are believers in Facebook. Online your market, your users, enter into a dialogue with you, so you have an opportunity to know what they’re thinking about. Is there any business for journalists online? Well I compare myself with doctors and teachers – thanks to internet and social media our customers wise up. A doctor gives you medicine and you take it, maybe you were cured, maybe you died. Now you go and say, ‘I think I have this because I looked it up on Google’. So are doctors going to disappear, no. We still go look for a doctor to make sure you’ve got it right. I need dialogue. This entry was posted in Business, Events and tagged ARA, business models, Carles Capdevila, Events, Ismael Nafria, La Vanguardia, Media140, paywalls on April 14, 2011 by Rachel Bartlett. “I’ve never lived something like that and I don’t think I will live something again like that,” – these are the words of El Pais staff writer Joseba Elola, reflecting on his work on the diplomatic cables released by WikiLeaks. Speaking on a WikiLeaks roundtable discussion at #media140, Elola spoke about the journey from arranging to meet with Julian Assange for an interview, to helping El Pais join outlets such as the Guardian and Der Spiegel as a media partner of the whistleblower website in its release of more than 250,000 secret and confidential cables sent by US embassies around the world. Three months after requesting an interview with WikiLeaks founder Julian Assange, the pair met, Elola told the conference. He is a fascinating character, a brilliant person, extremely intelligent. At the end of the interview I asked him if he had anything on Spain. Why don’t you include also a Spanish media as part of your launch, I asked him, why don’t you transfer your documents to El Pais, we will help. He said let him mull it over. I came back to Madrid, I was excited and then quite an ordeal began. You meet them, you see them, but then it takes a long, long while to get to see them. I got an email from him three weeks afterwards and in the newsroom we were excited, finally that long-awaited email came asking for the specific number for the director. I have never lived anything like it in my life, it was like witnessing history of the 21st century. All of a sudden you get new information every day, day after day, it was a very exciting experience. Speaking further with Journalism.co.uk he added that while he fears it will take “years before we manage to get another release of such relevant information”, he is “so happy to have been able to play a little role in that story”. I hope we keep on being a reliable media for any platform; WikiLeaks, OpenLeaks, KanariLeaks, BrusselsLeaks or whatever. I think the important thing is to keep your brand reliable to the public and I hope that the fact we were involved in Cablegate might raise some confidence in the people who leak information into the public, too. I really think the media for years have been a little bit asleep and didn’t do their job properly, and I think WikiLeaks brought something really good for journalism and for society. This entry was posted in Events, Investigative journalism, Journalism and tagged cablegate, El Pais, Joseba Elola, julian assange, Media140, Wikileaks on April 14, 2011 by Rachel Bartlett. The Guardian today reports a group of unpaid bloggers for the Huffington Post, unhappy with the money being made from the $315 million sale of the site to AOL, have filed a $105 million lawsuit for back pay. According to the Guardian the action is being led by Jonathan Tasini, a writer and trade unionist, quoted as complaining that “people who create content … have to be compensated” for their efforts. Discussing the action with Journalism.co.uk’s senior reporter Rachel McAthy at #media140 today was Pat Kane, who also blogs on the Huffington Post. Speaking following his keynote speech at the event he said he was “very skeptical” about the action. I never regarded the Huffington Post space as a commercial space. I think what’s more interesting is the extent to which the blog community keeps an eye on the Huffington Post and sees that its leveraging its investment in the right way. Is it becoming an even stronger platform for citizen involvement, for raising voices, for providing an alternative to the mainstream media or is it becoming absorbed by the mainstream media, are there subjects that it just won’t cover now? So to me the question is more about monitoring them as an enabling enterprise … And the extent to which they fail or trip up on that is the extent to which you don’t participate. One of the things about the internet is the exodus and not participating is often some of the most effective action that could possibly happen. The sense that something has lost its bloom on the internet … is a real caution to people. But as I say if one hears stories of the editorial breadth and integrity of the operation being constrained then that’s the point at which I wouldn’t write for it. I’d rather test it out and practice than actually go down a route that says I’m doing this because I expect a return. You participate in these things because you want to be part of a community and you want the freedom to express and then you also want to be part of a big conversation you weren’t part of before. The extent to which you make an earning part of your portfolio is a different question, I’m not as anxious about that. This entry was posted in Business, Online Journalism, Social media and blogging and tagged Huffington Post, Media140, online bloggers, Pat Kane, The Guardian on April 13, 2011 by Rachel Bartlett. Writer, musician and activist Pat Kane opened the #media140 conference today, with a keynote speech focusing on the relationship between traditional news organisations and new media, on both an editorial and business level. He told the audience that journalists and news organisations are having to decide between the model of the open web, or “move back” to a closed, paid-for network. Or he added, find ways to mix the two. Newspapers are trying to figure out basic problems of economic survival. There seem to be two pathways opening up, two models to pursue for journalism to survive. One is the move started by Rupert Murdoch initially, with the Times and Sunday Times. He has decided that the age of the free lunch, or free information lunch, for news and the web is over, and wants to try and claim back some of the revenue which has been lost. On the other side is the Guardian – their attitude is embrace the new open free sharing web, they said let’s use that as a resource for the paper rather than an enemy of the paper. … At the very least we can say in the current climate and relationship between new media and journalism that there are two quite distinct paths. It is an open question as to what is going to be the best. He said the open web nature of many news outlets today is “economically troubling, but culturally fantastic”. Kane, who helped start up the Sunday Herald newspaper in 1999, also discussed the challenges facing traditional news outlets on an editorial basis, such as that in part it “returns journalism back to a sense of its basic ethics”, why are we doing journalism, he asked. Or as he later concludes, new media gives journalists “a boot up the arse”. Journalism isn’t marginal, it becomes central to the health of an information society. It becomes what you do to keep the society healthy. The problem is for professional journalists, is it becomes a general function of dynamic engaged citizenship. It becomes a new requirement of citizenship, rather than a job paid for by classified ads and about recycling press releases. Illustrating his point early on with videos filmed by civilians on the ground in countries such as Bahrain, capturing for example protestors being shot as it occurred – “it’s not journalism, its anthropology”, he said. It could only have been recorded by someone participating in that moment. But what’s interesting is that I found them on a blog on the NewYorker.com. Traditional organisations can still provide a frame for the image and a context for the text. Quoting social media consultant Joanne Jacobs, he said: “In a world of players and publishers, the only remaining scarcity is referees and editors”, and this, he said, is the strength of an institution, to bring such footage and news to the attention of a busy professional who wants to go to the right place to find the right information. This is the role for journalism, conceived in a new media world, he added. And if editing and curation is scarce, we should be able to make money out of it, he added, returning to the ongoing question of the business of traditional media in the new media environment. Responding to a question asking if the journalism industry is going “back to square one” in terms of editorial control, he said on he contrary, the internet has brought down many of the barriers to becoming an ‘editor’ in the first place. Yes the internet is anarchic, and rightly so, but there’s also a concept called heterarchy, which means a lot of structures – as well as chaos. Editorial need to think of itself more ambitiously and not get hung up on normal organisational forms. This entry was posted in Events, Online Journalism and tagged digital journalism, Events, Media140, Pat Kane on April 13, 2011 by Rachel Bartlett. Today and tomorrow Journalism.co.uk will be attending the Media140 event in Barcelona. You can see the full agenda for the event here. Coverage will be available on Journalism.co.uk’s news and blog pages throughout the two day conference, and you can also keep an eye on Journalism.co.uk’s Twitter channels @journalismnews and @journalism_live for other tidbits during the event under the #media140 hashtag. 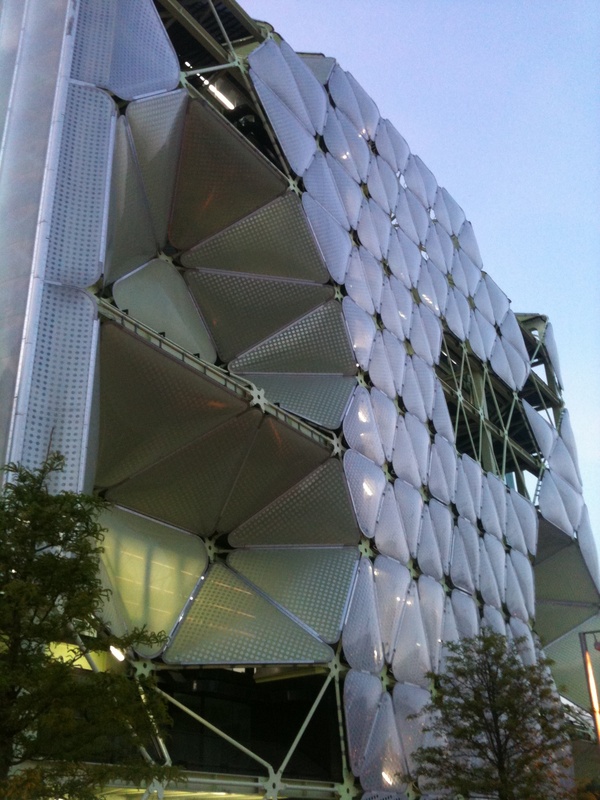 Picture shows Media-TIC building where Media140 Barcelona is being held. This entry was posted in Events, Journalism and tagged conference, digital journalism, Events, Media140 on April 13, 2011 by Rachel Bartlett.